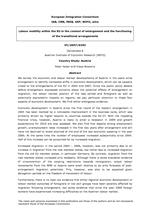 This study presents an overview of labour mobility in Bulgaria in the context of the significant socio-economic transformation after 1990 and the enlargement process. It describes the steps in the institutional setting of labour migration and its main patterns, outlining the changes in the stocks and flows of migration before and after the enlargement. Based on the existing literature the study summarizes the effects of migration on the national economy and labour market. The study emphasized that the design of an effective national migration policy needs a clear distinction between the short-term impacts of labour emigration and its long-term effects on the socio-economic development.